Ladies and gentlemen, good morning! I was looking for something to fill the spare minutes today, so you know, when Adam’s invitation came through, I thought, well, what better way than to come to the BCC Conference. I want to thank you sincerely for the invitation to speak today. For more than 150 years, the Chambers have sat at the heart of the United Kingdom’s business community. Today, there are tens of thousands of businesses represented in this room, and the network of Chambers, include the employers of nearly six million people in every part of the UK. So I want to start by recognising the huge contribution that you and Chamber members make to creating wealth and providing jobs and livelihoods in communities right across this country. I want to say thank you for something else, as well. I was listening, early this morning, to Adam’s dulcet tones on the Today Programme. And every time I’ve worked with Adam, we go back a few years now, from my various ministerial capacities, what I know is that he and the Chambers, in general, will give it to you straight. Just as I’ve always said to my officials, in every job I’ve held, that no one will be penalised for giving me advice that is honest, but perhaps unwelcome - I think that is of equal importance in terms of a dialogue between government and outside organisations. It may mean that, at times, there is friction and disagreements, but actually, it’s part of a healthy, free society, that there should be that candour in relationships between us. My starting point this morning is to acknowledge the fact that we are living through a time of turbulence. There are the global shifts in economic power, geopolitical trends and technological change, that we have respond to so we can ensure that this country remains a successful and open trading nation. Over the next decade the world economy will be dominated by the EU, the US, and China. UK trade with those blocs is valued at £637bn, £184bn, and £66bn respectively. And by the middle of this century, the US, China and India will make up something like half of total global GDP. And according to a report by PWC the combined economies of China, India, Indonesia, Brazil, Russia, Turkey and Mexico will be double that of the G7. The population of Africa will double to almost 2 billion people. Now, the expansion of these emerging markets offers opportunity for business in the UK as we seek to grow exports from 30% to 35% of our GDP. New technology, and our international relationships, also offer opportunities to enhance UK prosperity. But digital technology also creates profound long-term changes in our economy and in assumptions about work and careers. Because you don’t need me to tell you that the impact of digital technology is going to shake up established ways of doing white collar and professional work, and not just alter the working environment and expectations on the factory floor. So we face risk as well as opportunity. The World Bank’s recent forecast predicts that global growth will slow to 2.9 percent this year. International investment and trade are moderating, trade tensions are elevated, and protectionism around the world is increasing. These times, and I suspect this will be a view shared by many here, these times are more unpredictable than we would like them to be. And that is certainly true of the process of EU exit. I recognise the real frustration that uncertainty around this process has caused in the business community. I am acutely aware that for you, and the businesses you represent, this is about the practicality of doing business, about having predictable relationships with both customers and suppliers. This is a message I have heard repeatedly from businesses across the United Kingdom, from salmon processors in Rosyth to ice cream makers in Coleraine. You want to know the terms of trade so you can focus on running your business - with certainty about the people you can hire, the regulations that apply, the tariffs on imports and exports. I get it that you don’t want to spend time poring over the latest parliamentary developments and scanning the pages of Hansard. So I want to assure you that, from the Prime Minister down, the government is doing all it can to secure a Brexit that does honour the result of the 2016 referendum, but does so in a way that protects jobs and economic growth. I also understand, in part taking up a point that I heard Adam make this morning, that a chaotic, disorganised exit, without an agreed deal, is something that we should not be seeking to have. This is, unavoidably, the legal default position. But as far as the Government is concerned, this is a matter of necessary contingency planning. It is not the destination or objective of government policy. Such a No Deal Brexit will undoubtedly mean disruption to businesses in every part of the UK, and I believe, would be a threat to the integrity of the union of the UK itself. Despite the political uncertainty, it is a tribute to the strength of UK business that the British economy remains robust. It has grown for nine consecutive years. It has the longest unbroken quarterly growth run of any G7 economy. As the Chancellor set out in the Spring Statement, both the IMF and the OECD are forecasting the UK to grow faster than Germany this year. And, crucially, our economy is forecast to continue growing in each of the next five years. UK businesses and UK workers with, I would argue, support from government policy, have built an economy that has created more than 3.5 million net new jobs. And we need to keep repeating the message, that despite what some of the media reports would suggest, 96% of those new jobs created last year were full time. The female employment rate in this country is the highest on record, with 1.2 million women-led businesses in the UK. And wages are now growing at their fastest rate for over a decade. Meanwhile, we are on track to meet our fiscal targets, our national debt is falling sustainably, and taxes at the corporate level remain low, to attract talent and spur investment. That is coupled with this government’s commitment to helping business thrive - thanks to our Industrial Strategy, the British Business Bank is now supporting more than 78,000 smaller businesses with more than £5.5 billion of finance. And we will also provide management training to 10,000 small business leaders by 2025 through the Small Business Leadership Programme. But to seize the opportunities in the global economy, we need to ensure we are doing all we can here at home to improve our productivity and competitiveness. A key focus of my role, as Minister for Cabinet Office, is to drive forward implementation of the government’s policy reforms. I’m pleased to say that despite everything else that’s going on, we’ve made significant strides in domestic reform. Since 2010, we have invested more than a quarter of a trillion pounds of investment in infrastructure, including the biggest rail programme since Victorian times. But there is still much more to do to improve productivity, to boost our infrastructure, and invest in the people that we need. Take housing. We need to fix the housing market in this country for two reasons: first, so that there is a workforce which can be mobile and respond to the changing needs of British business. But also, because frankly, as a matter of social justice, we cannot be content with a situation in which younger people, who are working hard and earning decent salaries cannot afford to get even the first foot on the housing ladder in parts of our country. So we are working to build more homes and backing home ownership, delivering over 222,000 additional homes in the last year, cutting the Stamp Duty tax for 95 percent of first time homeowners, and increasing our affordable homes programme to £9 billion. We are also investing £400 million through the Digital Infrastructure Investment Fund – to ensure that businesses and homes across the country benefit from faster and more reliable broadband. And we are building the technical skills our workforce needs, something that in pretty much all my meetings with business, whether at the local or a national level, I’m told is something this country really needs to do. And developing new policies in partnership with employers themselves. So beginning in 2020, we’ll be introducing T Levels, which will offer 25 high quality courses that give a clear line of sight to actual job roles. And we are also focussed on harnessing the power of apprenticeships. 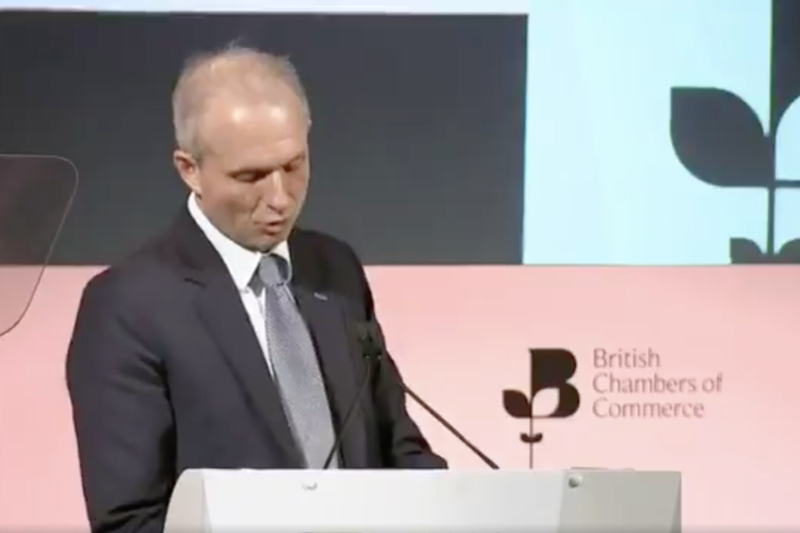 In the Spring Statement, Philip Hammond responded to the concerns that the BCC and others have raised and announced a £700 million reform package to help small businesses take on more apprentices. But for all we are doing to build a strong environment for business, we also face a paradox where there is less faith in capitalism, in terms of UK public opinion. Government and business need to work together to restore the reputation of free markets by demonstrating that they can and should work for everyone. As the Prime Minister has said, offering someone a job – and creating opportunity for other people – is one of the most socially-responsible things that you can do. I believe that companies acting more responsibly and markets working more competitively are the twin pillars of restoring trust in those free markets. For our part, the government is doing more to build a diversified marketplace that puts small and medium sized businesses and strong social values at the heart of public services delivery. I have committed to using the government’s £49bn annual buying power to drive social value and provide a more diverse and competitive market. So for the first time, all major procurements will explicitly evaluate social value. And because we know that smaller businesses tend to be closest to the communities they serve, we’re aiming to further open up the procurement process to SMEs. This is all part of a government-wide initiative to level the playing field for small businesses bidding for government contracts by cracking down on suppliers who don’t pay on time, and breaking down contracts into smaller lots to make them more accessible. And the Prime Minister has appointed ministers from every government department to help us meet our aspiration of spending one pound in three with SMEs by 2022. So we should recognise the fundamental strength of our economy and the progress we’ve made in domestic reform, especially through our industrial strategy. But we need a smooth and orderly departure from the EU which delivers on the results of the referendum and is managed in a way to protect jobs, living standards, and investment. And I’m grateful that the BCC has been out there, stating your support for getting a deal over the line. Your voices are incredibly important, as those who have been creating jobs, driving exports, and investing in our economy. In recent days, both the Prime Minister and I have been engaging constructively with Leaders and Member of Parliament from across the House of Commons. Between us, we have met leaders of all the other parties in the Commons as well as other senior Parliamentarians, and we will continue to do so. In last night’s votes, the House of Commons considered a wide variety of options as a way forward. None of them attracted a majority. And I think what those results demonstrated is that there are no easy, simple options. The deal that the government has negotiated is itself a compromise, both with the EU and with political opinion at home. We haven’t secured everything we want - neither has the EU. Businesses understand compromise is the essence of any complex negotiations. I remain of the view that the deal the Government have negotiated is the best option available. And I think that every Member of Parliament, regardless of which political party he or she represents, regardless of which part of the country they serve, has to face up to the fact that any deal, any aspiration for the nature of the future economic relationship between the UK and the EU, must include as a starting point, the Withdrawal Agreement that has been negotiated with the EU. If you believe in delivering the referendum result by leaving the EU with a deal, then it is necessary to back the Withdrawal Agreement. For whether a particular MP wants the final destination to look like Norway, or look like Canada, or look like the proposals in the Chequers White Paper, the starting point is the Withdrawal Agreement itself. And that would apply even in the event that the UK reverted simply to WTO terms. For the EU has made it clear that any negotiation about a future preferential or free trade agreement will need to start with agreement on the key elements of the Withdrawal Agreement. In particular, citizens rights, a financial settlement, and arrangements to secure an open border on the island of Ireland. So the government remains committed to an Agreement that ensures our smooth and orderly departure from the EU and delivers on a time-limited Implementation Period during which trade will continue on current terms that protects the rights of EU citizens living in the UK and UK citizens living in the EU, meaning no disruption to your existing workforces. And in a way that ensures that there is no hard border between Northern Ireland and Ireland, and no customs border in the Irish Sea. And earlier this month, we secured legally-binding assurances that guarantee that the EU cannot act with the intent of applying the so-called backstop indefinitely. By leaving the EU with a deal and an orderly transition to a future economic partnership, as the Chancellor has said, we will see an economic boost from improved business confidence and investment; as well as a boost from the fiscal headroom once a no deal Brexit is definitively off the table. So the responsible course is to back this deal, and deliver on the vote of the referendum, and bring an end to the uncertainty. But if Parliament comes together and backs the deal, then in just under two months, we could be out of the EU and into the implementation period. As somebody who campaigned very strongly for Remain in 2016, I think that is the best choice available to us that both respects that democratic verdict and which safeguards the economic interests of this country. The alternative is more division and more uncertainty, with all the risks that will entail. And I think now, politicians of all political parties have a duty to put the national interest first, so that we can put this controversy behind us and move on to a brighter future for the British people.